Silhouettes have an amazingly calming effect. I have two silhouettes pasted on my bedroom walls. 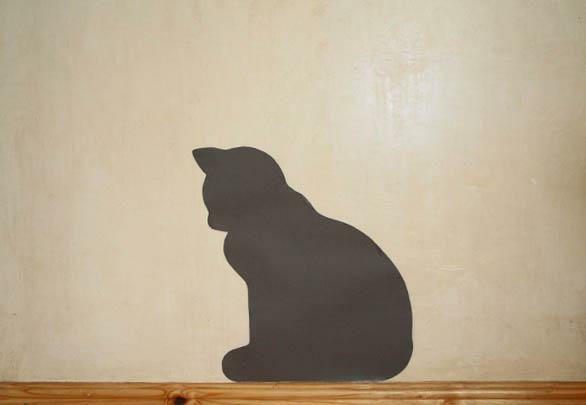 I came across this poor cat silhouette, all tattered and torn sorting through my mom’s old school stuff (she was a Grade 2/Sub b teacher) and became transfixed with it. It was so beautiful I couldn’t let it be thrown away. So…I got hold of some charcoal card, traced the shape and cut it out. It now sits on my skirting board and every time I see it, it’s simple beauty calms me. The other cut-out I have are three swallows. I have a fascination with maps and I hate the way that old maps, artworks, just get chucked away. My first idea to ‘rescue’ them was to create paper bags out of them. But this never materialized and I still have a stack of old maps under my bed. At the same time as this was going on I was busy doing a textile design with birds and loved the shapes I was coming across. I choose the swallow silhouette, worked on it a bit and cut it out of the maps. 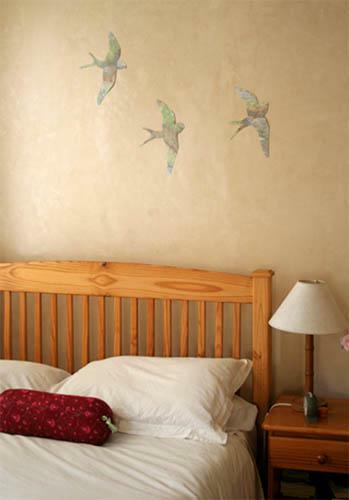 They now fly above my bed and fill a wall that would ordinarily be quite boring and plain. I love the correlation created by the swallow and the map. I have gotten a lot of compliments about them and really all they were was an experiment to fill a space when I had no money and little time. I have grown to love them and think I will keep them when I move one day. 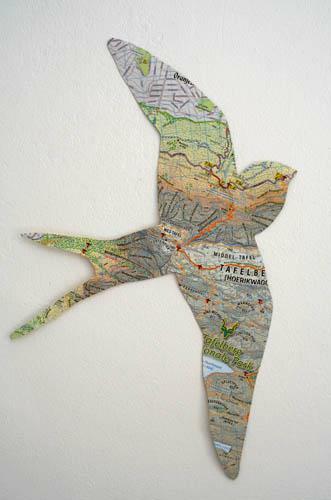 This entry was posted in Blog and tagged art, Artwork, Cutouts, Maps, Old, Recycle, Silhouette, Swallow. Hello! Thank you so much for stopping by my blog and leaving such a nice comment :) Now that i’ve found your blog I lok forward to reading! Your bags are so cute by the way! 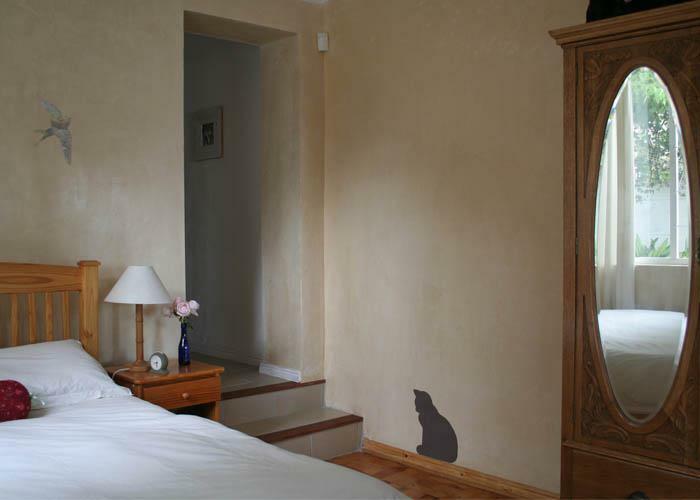 I love love the cats and the swallows… If it’s not too cheeky could I get hi-res images of the silhouettes too? I have a creative ideas but hardly ever bring them to life. I’m not terribly good at drawing and sketching but really really want to give this ago as your room looks fab! Sadly I do not have any jpegâ€™s or anything of these silhouette’s so there is no high res. They were drawn and cut out by hand and I do not have a scanner. The pictures on my blog and really as good as it gets. There are some awesome silhouettes available on istockphotos.com and deviantart.com. Perhaps you can find something there that will work for you there.